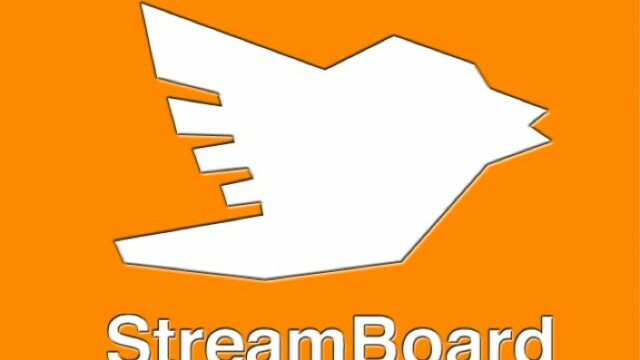 StreamBoard lets you watch Twitter in real time, and filter it as you please. Apple has just released, to registered developers, a new beta version of the upcoming iOS 5.1 to let them test their apps with it, and help weed out all the bugs. 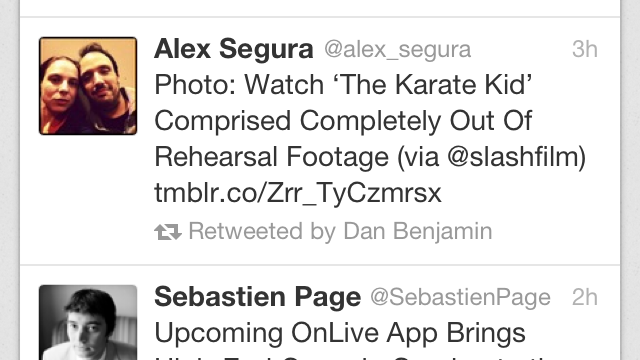 Twitter has just released a brand new version of its iOS Twitter client to the App Store. It features a brand new look for the iPhone version. It brings us great pleasure to inform you that our next batch of Festivus winners have just been selected and are now listed inside the Festivus section of the AppAdvice app. First 100 Festivus Winners Announced Today In The AppAdvice App! It brings us great pleasure to inform you that our first 100 Festivus winners have just been selected and are now listed inside the Festivus section of the AppAdvice app. Today On Festivus: The Parrot AR Drone! Festivus is now going stronger than ever and we can't tell you how thrilled we are with your great participation. Therefore, I'm excited to tell you that we have something even more thrilling for you for day two: a Parrot AR Drone. Happy first day of Festivus! Today, to start the celebration in a big way, we have partnered with the great folks at Zazzle to bring you an amazing gift: custom cases that you will get to design yourself. 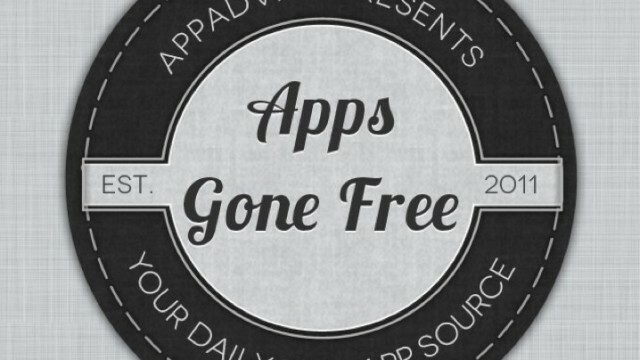 It's A Festivus Miracle: The AppAdvice App Goes Free For The Rest Of 2011! With the launch of Festivus tonight at midnight, it's our great pleasure to present you with a very special gift. On top of the many great things that you're going to be able to win during the next few weeks, we've also decided to throw something of our own into the mix, our excellent AppAdvice app. 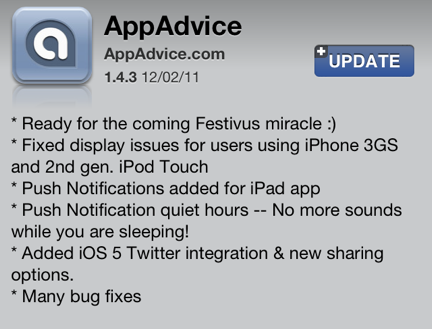 AppAdvice App Gets Updated - For Festivus And Beyond! Dear readers, we're very happy to announce to that we have just released a new update to the amazing AppAdvice app to add some features, fix some bugs, and prepare the great Festivus celebrations. 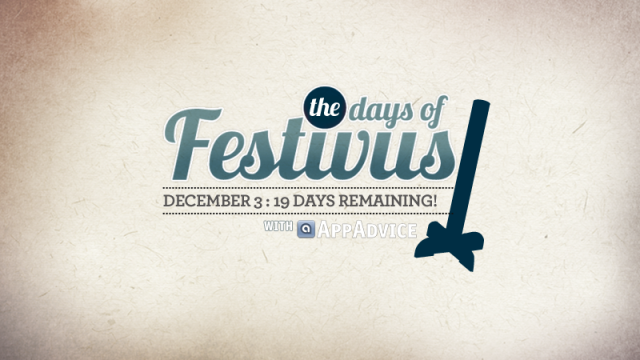 Festivus Is Coming To Appadvice - An Incredible Giveaway For The Rest Of Us! Big news folks, Festivus is coming! That's right, to celebrate the holidays this year, AppAdvice has prepared the single most incredible giveaway you've ever seen. Starting this week, and running thorough December, we'll be giving away some of the most amazing and exciting iOS accessories and apps you could ever wish for. 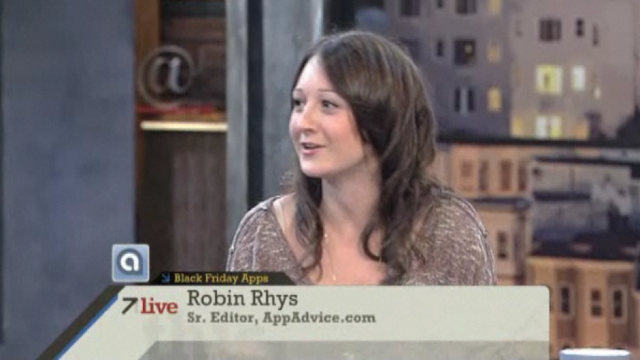 If you're a big fan of Robin Rhys and her wonderful daily appisodes (and lets admit, who isnt?) and you missed her special guest appearance on 7Live this week, you'll be glad to know the video is now available online. In case you haven't already spent your night running from store to store, here is a friendly reminder that Apple's Black Friday sale for this year is now available both online and in-store. Good news if you're brave enough to leave your house this Friday. 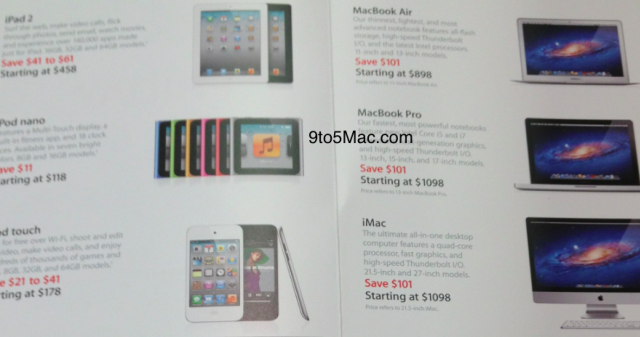 As mentioned in our wonderful roundup, Apple is preparing some great deals for this Friday and you're probably going to want to drop by the Apple Store. We're hearing some surprising and unexpected news from Bloomberg that suggests Apple has decided to allow subscription based game distribution in the App Store. 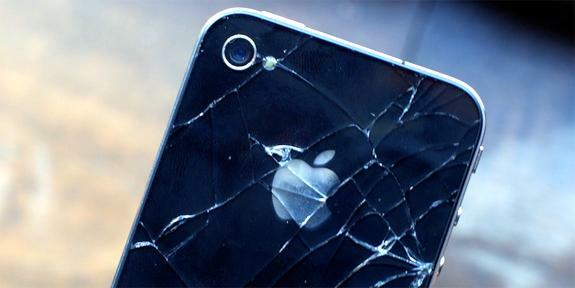 If you're still on the fence about whether your new iPhone needs a full warranty against accidental damage, an extended warranty, or nothing at all, there's good news as Apple has once again made its rules more flexible to accomodate new iPhone owners. The web is getting all excited tonight over a potential hack that is reportedly allowing users with carrier locked GSM iPhones, to unlock their device to use on any network like T-Mobile. It's particularly simple, and requires no software or hardware modifications. 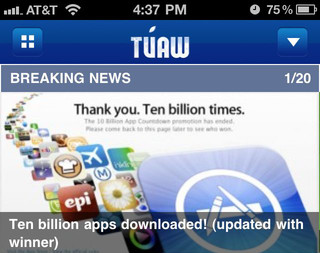 We're happy to inform you that TUAW has finally updated its app for full iOS 5 compatibility and has added some much needed new features. Good news folks, the official native Gmail client for iOS has finally been fixed by Google, and is now available in the App Store again. Folks, we are thrilled to announce that AppAdvice's most popular daily colum is getting an app of its own today. 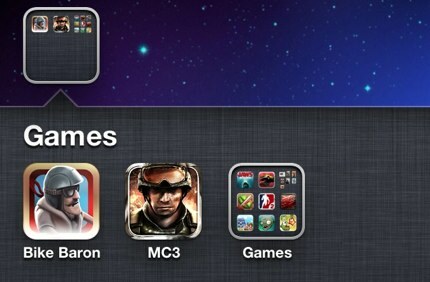 Ladies and Gentleman, please welcome, on your home screen: Apps Gone Free - The iOS App. While iOS 4 changed the game for many users with OCD tendencies, due to the addition of folders, the folders themselves can become a bit of a mess. What if you could put all of your folders inside folders? If you were disappointed by the fact that Apple has made Siri an exclusive iPhone 4S feature, there is still some hope for you. 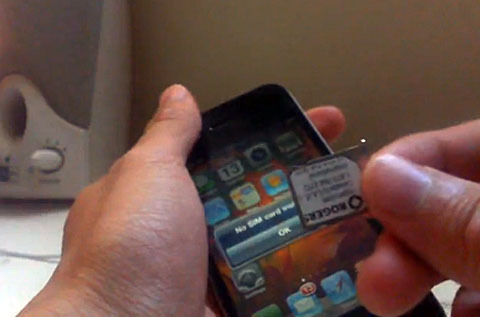 We're hearing that there is still a chance that Apple will be bringing the feature to older iDevices such as the iPhone 4. 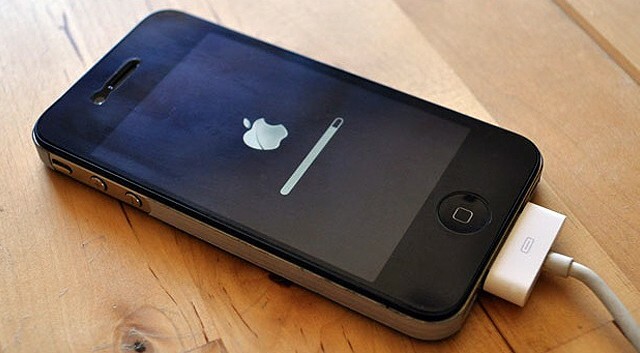 If you've been having battery issues with iOS 5, or your iPhone 4S, everything should be getting back to normal soon. 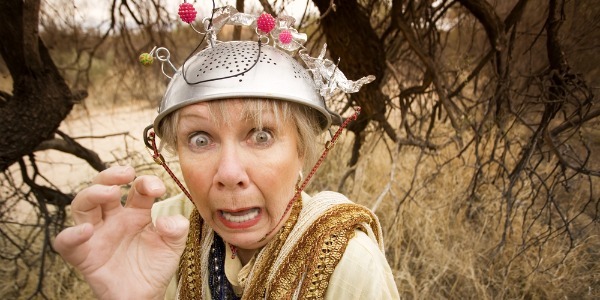 Indeed, Apple has announced that it has figured out the problem, and will be releasing a fix to the public very soon. In the meantime, they just released a first fix to registered developers, to see if it improves the battery, as well as an array of other issues. 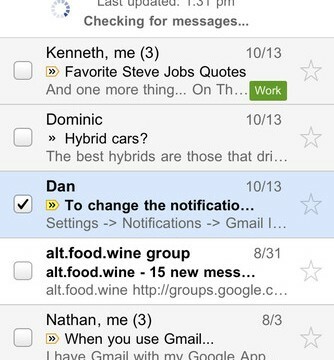 Confirming yesterday's rumors, Apple has, this morning, approved Google's new official native Gmail app for iOS. 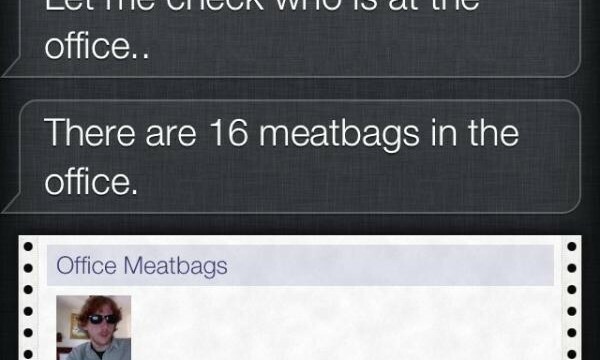 If you've ever dreamt about having Siri do things to for you that it wasn't programmed to, you're in luck. 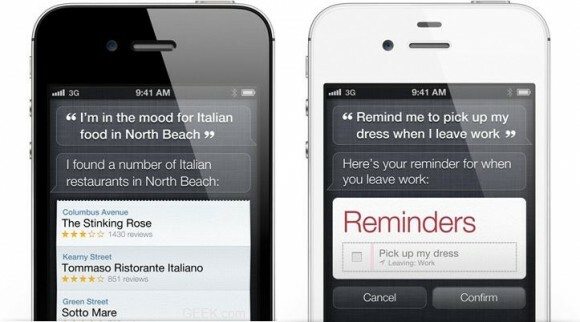 One savvy GitHub developer has reportedly managed to hijack the network connection Siri uses to return his own custom responses.